Neville’s brother, Phil, joined England Under 21s as a coach over the summer. Gary Neville has admitted that England’s youth football campaign has been disappointing but believes there is hope for the future. England Under 21s failed to register a single point at Euro 2013, even with the help of Gary’s brother Phil as a coach, while Peter Taylor’s Under 20 side finished bottom of their group at the FIFA U20 World Cup, which is still ongoing. In addition, the Under 17 side failed to qualify for the European U17 Championship and the Under 19 side failed to qualify for the final tournament of their equivalent. Overall, it has been a very bleak summer for England’s young generation, but Neville remains optimistic for the future. Neville said: “They haven’t done well as they would have wanted. And it’s disappointing, tournament football is one of the most difficult things you’ll do. 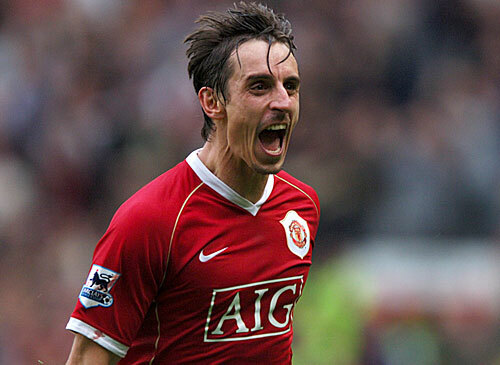 Neville added: “All the things that, when I was growing up, weren’t so prominent. It was all about success, winning, hard-work and what we’ll see now is that we do start to produce more technical players. “We’re starting to see the fruition of that, players like Jack Wilshere, Daniel Strurridge, Ryan Betrand and Kyle Walker. Think about the type of full-back that we’re now producing, Ashley Cole, Kyle Walker, Ryan Bertrand and Luke Shaw. They’re not the full-back of 20 years ago, they’re different. “The centre-forwards we’re producing are not your Alan Shearers, who was an excellent player, and Mark Hateley, they’re more Daniel Sturridge.